In a messy room peppered with strange electronic appliances, unused computers, a water boiler and an antennae, four engineering graduates, all in their mid-20s, are hard at work. 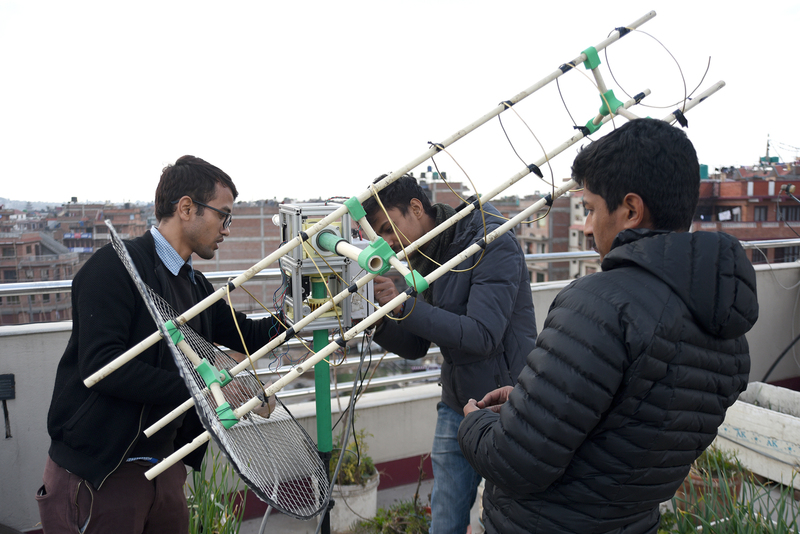 Bent over their computers on the first floor of a six-storey building in Kamalbinayak, the four engineers are working on the Nepal PQ-1, Nepal’s first picosatellite. While Nepal is also part of the Japan-supported Joint Global Multi-Nation Birds Satellite project, which helps non-space faring countries launch their first satellite, the PQ-1 is set to be the country’s first fully Nepal-made satellite to be launched into space. Except for some minute work, which needs to be done in China, all of the design, assembly and testing is being handled by the four full-time engineers, plus 20 other part-timers, in Bhaktapur. Since the PCBs [printed circuit boards] the Nepal PQ-1 requires are two layered and their traces are very thin, it is not possible to fabricate them in Nepal as of yet, according to Avhinav Mainali, one of the two dozen engineers working on the project. “But beside that, we made this tiny spacecraft and all the elements in it. It will be the first all Nepal-made project that will travel to space,” said Mainali, a graduate of electronics and communication from Khwopa Engineering College. A picosatellite is a cube measuring just 5x5x5 centimeters and weighing less than 250 grams. The PQ-1 is layered with three primary subsystems—an onboard computer, an electrical power system and a communication subsystem. The PQ-1 is powered by solar cells and a lithium-ion battery is used to store the energy the cells receive from the sun. After being launched, the satellite will travel as high as 500km from the earth’s surface up to the lower earth orbit. Once there, the satellite will rotate the earth at an escape velocity of 7.8km/s, completing one rotation around the earth in 90 minutes. It will remain in space for an estimated one year. The primary mission of the satellite, the makers say, is to measure space radiation. “Its secondary mission is to test the ‘store and forward’ application, where the satellite will collect data (eg, wind, humidity, temperature, water levels) from Earth-based sensors, store the data on-board and then transmit it to ground stations [which will be placed in various spots around Nepal],” reads a note released by ORION Space, the company behind the project. The project is the brainchild of Rakesh Chandra Prajapati, who holds a Masters degree in electronics with space technology from the Swiss Federal Institute of Technology in Lausanne, where he currently works. After working for about five years in Switzerland with biomedical and space-related companies, Prajapati decided to start teaching space technology to Nepali students online. During this process, he contacted students from Kathmandu University, his alma mater, and selected a few graduates who were enthusiastic about working and learning about satellites and space technology. The team first started on a project to build a CanSat—a satellite model that can help in the making of a real satellite--in 2015. Prajapati then created a Facebook page called ORION Space and reached out to more students. The company was officially registered in 2017, which was when they started work on the PQ-1. The complete building of the satellite is expected to cost around Rs 2.5 million while launching it into space is going to cost another Rs 2.5 million--all of which Prajapati has so far been funding out of pocket. However, he is searching for sponsors to support the satellite’s launch. According to Prajapati, ORION’s long-term goal is to build bigger satellites in Nepal for applications like disaster monitoring and agriculture monitoring. For the satellite to launch, International Amateur Radio Union (IARU) has to approve a unique frequency at which it operates, for which an application has to be forwarded by the Government of Nepal, but the government currently doesn’t have any rule as such regarding this procedure. But if all goes well, Nepal’s first picosatellite will launch in 2020, via the Vector R rocket, owned by the launch provider Alba Orbital, a British company specialising in mini satellite manufacture.